The golden hour of the time a patient with chest pain receives rapid diagnosis and treatment is the difference between life and death. Opening a patient’s artery with an angioplasty balloon 90 minutes after arrival is a standard quality indicator for hospitals nationally. 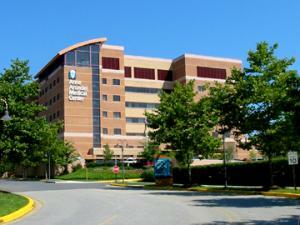 At Anne Arundel Medical Center (AAMC), the average “door to balloon” time is just 58 minutes. This rapid diagnosis and treatment of patients with chest pain due to heart disease is one of the reasons AAMC is one of only nine hospitals in the state to receive Chest Pain Center Accreditation with percutaneous coronary intervention (PCI). The accreditation is awarded by the Society of Cardiovascular Patient Care (SCPC), an international not-for-profit organization that focuses on improving cardiovascular care. This is the gold standard for chest pain accreditation. It demonstrates that AAMC is providing nationally recognized standards for quality patient care, which includes having dedicated interventional cardiologists, nurses and technologists trained in rapid response and treatment of heart attacks to reduce heart muscle damage. The hospital began performing emergency cardiac catherizations for acute heart attacks in 2002. “An accredited chest pain center is known for providing better care, better diagnosis, faster treatment and decreased length of stay in a hospital. Part of the reason for this is the close collaboration with the local emergency medical system to provide advanced care from the time they pick up the patient until they enter the cath lab,” adds Ms. Blackburn. The accreditation is a rigorous three-year process that examines the hospital’s policies, processes and performance measures in diagnosing and treating patients with acute coronary syndrome. Part of the requirement is to support community outreach programs that educate the public to immediately seek medical care if they have symptoms of a heart attack. According to the SCPC, heart attacks are the leading cause of death in the United States, with 600,000 dying annually of heart disease. More than five million Americans visit hospitals each year with chest pain. The goal of the SCPCis to significantly reduce the mortality rate of these patients by teaching the public to recognize and react to the early symptoms of a possible heart attack, reduce the time that it takes to receive treatment, and increase the accuracy and effectiveness of treatment.